Forgive me if you’re tired of answering this question already, but why sestinas? Oh I never get tired of answering the “why sestinas” question. It’s a fair question to ask why would anyone assemble an anthology based on an 800-year-old form. The short answer is I’m fascinated by the enduring appeal of this form, how poets and other artists have been drawn to its fairly elaborate scheme—and in different languages, from Latin and Italian, on to French, German, and English. A slightly longer answer focuses on its present renaissance in English, which has been going on for almost 100 years, and how such a wide variety of poets, from neoformalist to avant garde and every point in between, have taken the sestina under their movement’s wings. It’s an ultimate form for those who stress the validity of received forms in the 21st century, and it’s also so elaborate and procedure-driven that experimental poets can put air quotes around the word “poetic form” and write ones that fulfill their own doctrinal regulations. 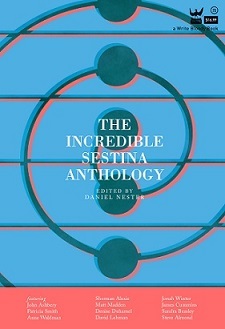 In a poetry world that often divides itself among aesthetic teams, the sestina demonstrates a rare common ground.